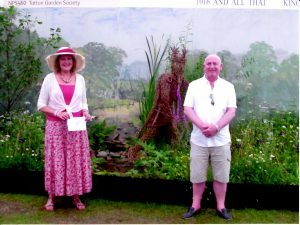 Tatton Garden Society won a silver medal at the RHS Tatton Park Flower Show with their garden entitled “1016 And All That”. The garden celebrated 1000 years since King Canute forded the River Lily at Knutsford. Meadowmat Woodland Shade is an integral part of the garden’s design. The RHS Tatton Park Flower Show is held near to the town of Knutsford in Cheshire. Legend has it that Knutsford was named after King Canute because it was here that he forded the river Lily in 1016. The name Canutesford appears in the Domesday Book; over time this has been distorted to become Knutsford. 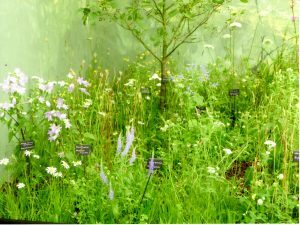 Why Use Wild Flowers In A Show Garden? Garden Designer Alex Ellison, quite rightly felt that the plants and flowers used in the garden should be representative of what was growing in the area in Canute’s time. Because horticulture as we know it, was in it’s infancy at that time, native wild flowers were the obvious choice to replicate the landscape of the era. The medal winning garden at Tatton Park Flower Show with wild flower species labelled for the public. The backdrop gives depth to the garden and makes it appear bigger than it is. It shows how the landscape of the time was a mix of woodland, scrub and marsh. Paints were kindly donated by Farrow and Ball and the two artists did not charge for their time. Alex chose Meadowmat for Woodland Shade as the basis for her planting scheme. The 38 species of native wild flowers and grasses would have thrived in the landscape of the time. Meadowmat saved Alex an awful lot of time on buildup day. She found it so simple to use pre-grown rolls rather than plug plants. Meadowmat was donated by Harrowden Turf Ltd. To ensure that it looked its very best in time for the show, Alex had it delivered early and transplanted it into bread crates full of low nutrient soil. She nurtured the wildflowers for the 2 months or so preceding the show. 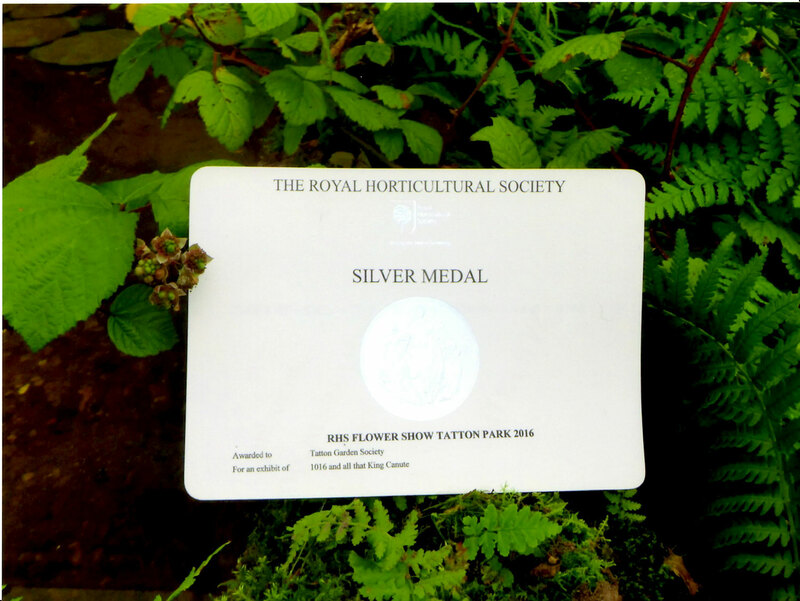 As you can see from the pictures her efforts were rewarded with a stunning floral display…..and a silver medal. King Canute was created by willow sculptress Caroline Gregson especially for the show. He has now moved to the Knutsford Heritage Centre. Tatton Garden Society was formed in 1962 and currently has 400 members who share a passion for the many aspects of gardening. The charity was originally centred in the walled garden at Tatton Hall, but is now based in the Lovell Quinton Arboretum just 12 miles from Knutsford. The 28 acre arboretum is open to the public and well worth a visit – why not make a day of it and visit both the arboretum and the Knutsford Heritage Centre?